In this class format, you will have a chance to sit, relax and learn many tips from your instructor. I will demonstrate how to make the recipes and you will enjoy a generous tasting of all the recipes we are making. I love to cook! It is a hobby of mine. I am constantly looking for new recipes and always cooking different things. Because I want you to see how easy it is to cook, I am now offering cooking classes. Those cooking classes are open to everyone as long as one tells me in advance that they are coming. There are three formats to my cooking classes. I organize them monthly, you demonstrate the recipes, you take notes and sample. The cost is $30. per person. 3. You want to come to learn a skill. ( price will depend on the recipe). 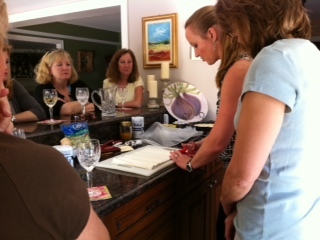 Cecile-I had a such a wonderful time today at the cooking class and can’t wait to receive my cooking items! Was so ready to go home and prepare a fabulous dinner for my family and am looking forward to easy entertaining! Thanks so much again!